Contents: Original Doom pwad levels with screen shots. Doom I/II related links. Check out the whole sequence of screenshots. Don't waste any time climbing the front stairs to Satan's huge mansion, rockets are already flying at you from both sides! You open the huge arched door revealing a pair of curved staircases. There's no time to admire the architecture though, you've already been hit by shotgun fire! This wad is for the original Doom v1.666. It supports single player, deathmatch, and cooperative play. It has multiple skill levels and secrets. All the secrets have clues; you never have to run along walls hitting the space bar, that's boring. The level includes all the weapons, but you have to fight your way through to them. On the highest skill level you'll have to be clever to deal with the two rocket-firing cyberdemons and four chain-gun-wielding spiders! Don't worry, it can be done, and to prove it, I've included a v1.666 lmp of me completely solving the level on the hardest skill level. You can convert pwads from Doom I to Doom ][ with wad1to2b.zip. Unfortunately I don't have room to post both versions. to play modem games with! These are searchable and list the player's preferred games. Internet Modem Players Listing has 47 listings for my area code, and lists players' computer and modem types. Modem Games Yellow Pages has 25 listings for my area code. The All-Time Best Doom Levels. A text only page with descriptions of dozens of Doom I and II levels. Matteuz Doom ][ Page. Dozens of pwads and utilities with descriptions. A lot of people don't know that you can record deathmatches. (All players must be recording.) When you play it back, you can switch to the views of the other players, and you can bring up the map and see arrows for all the players moving around. After a two player modem game, it's fun to play back both recordings simultaneously and watch the game together on the phone. This program lets you play deathmatch against three computer controlled players without a modem or network. 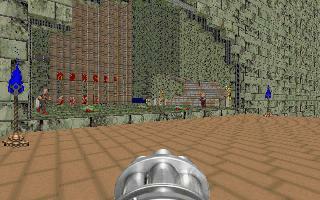 The players are smart and are armed with all the weapons, including the BFG. It's very much like a real deathmatch. Great for practicing at home for those after-hours games on the office network! 3D Action Gamers' Archive. About a hundred grouped and briefly described utilities for game editing. For those of you who use Dmgraph to edit graphics in Doom, here's a partial list describing the graphics entries. I made this for my own use.